Unfortunately this section has been a bit neglected but I really hope to get back into writing on here. In all honesty It has been a really hard few months since November 2014. Maya has been really poorly. Had several hospital admissions and at some points it was really touch and go to what what was going on. It all started with an increase in siezure activity which we had put down to urine infections. These developed in to longer and stronger tonic clonic seizures which were requiring alot of help to get her back with us. She also had a big increase in focal/absence seizure activity where she was having clusters of small seizures. In novemeber Maya became very poorly. she had some sort of episode where she became unconscious but not convulsive but also aspirated. 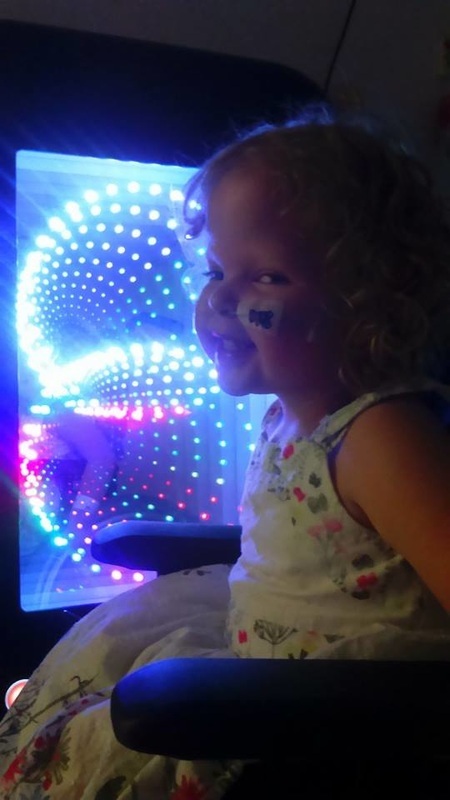 She was blue lighted to Peterborough hospital and then transferred to Addenbrookes. She stabilised after a few days but remained in like a vacant state for over a week. she was unable sit, talk, express emotion, cry. she literally stared into space and even needed help with blinking, She didn't seem to recognise who we were and it was like she was staring through us. Maya was dependant on iv fluids and medication for several days and then progressed on to an ng tube. At this time we had no idea what was going on and what the the next few hours, days would bring. she was so poorly and nobody really had any answers for why she was like this. She had several different scans, tests, bloods, observations, xrays and several different specialists review her. The only real things that showed up were liver function and high carbamazipine levels in her blood. So repeat bloods were done and her levels were kept an eye on for several weeks. Over time Maya continued to make progress with much improvement. Maya continued to have her typical seizures throughout and reducing her carbamazipine made things worse again so the decision was made to change her anti-convulsion medication to Epilim so see if this would make a difference. She also continued to have episodes where she was very floppy, almost like she was drunk. We went backwards and forwards to hospital and to see her specialists with little break through to what has happening. I kept a diary of everything that went on to try and find any type of patterns or reasons. I blamed myself, I thought I must be doing something wrong or she was being exposed to something that made this way but we couldn't find a link no matter how hard we tried. After several hospital admissions resulting with Maya being on IV fluids, her getting well again, being discharged home to be back in within a few days the only thing we thought it could be was her fluid levels and her kidney function. (This was sort of overlooked as a source because Maya's kidney function has always been quite poor and her doctors believed this wasn't a reason to have a sudden onset or present like this) We knew Maya's fluid intake had been reduced over the past several months and it kept reducing further and further each time she got poorly. Her urine output also significantly reduced and became a concern so the decision was made to try a ng tube for her fluid intake and medication and her anticonvulive medication was changed again to Keppra. Since having the ng tube fitted Maya has been like her old self. We have seen leaps in her development. she has become the happy, loving, little girl again that is full of spirit and determination. She has made progress in all areas at nursery and home life and is back doing what she does best SHINING BRIGHT! She still has off days and even weeks. Her epilepsy remains uncontrolled and we are working closely with her specialists to try and find the right combination for Maya but things are far more stable then they were and everything is heading in the right direction.